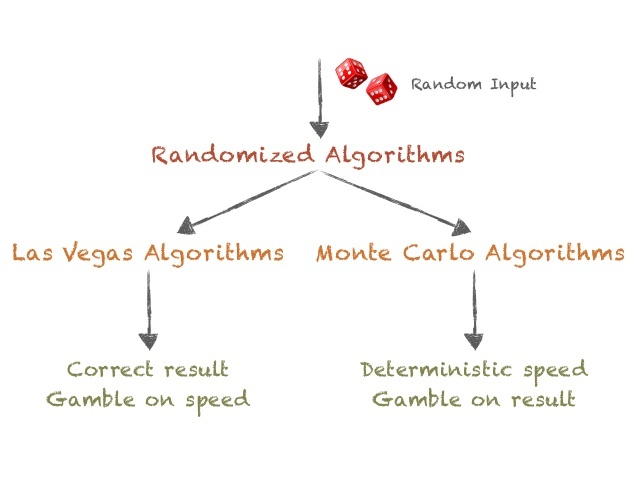 Randomized Algorithms are the state of the art in contemporary algorithm design. They are usually simple, sometimes even easy to analyze, and they work well in practice. This course provides an introduction to basic concepts in the design and analysis of randomized algorithms. A more detailed version of the syllabus is available as an archival pdf. Students are expected to have writing supplies on hand in each class to complete the in-class pop quizzes. If you are an athlete or for some other reason are not able to attend each class, make alternative arrangements with the instructor in the first two weeks of the course. Letter grades will be computed from the semester average. Maximum lower bound cutoffs for A, B, C and D grades are 85%, 75%, 65%, 55% (previously 90%, 80%, 70%, and 60%), respectively. These bounds may be moved lower at the instructors' discretion. We will be attempt to cover most of the chapters in the text, excluding chapters 2,9,13, but the focus will be on ensuring you understand the material. Accordingly the scope of the material covered may shrink or expand. Week 7: Lovasz Local Lemma and applications, the method of conditional probabilities. Reading: MR95 5.5--5.6. Week 10: Randomized Data Structure: Hashing, continued. Week 12: Markov Chains, continued. Weeks 13-14: Streaming Algorithms. Reading: Amit Chakrabarti's lecture notes Chapters 0,2,4. The final will be held Wednesday 12/20, 11:30am--2:30pm in Sage 5101. Here is a practice exam. All assignments must be typed (preferably in LaTeX) and are due at the start of class (defined as the first 10 minutes). Late assignments will not be accepted, unless you contact the instructor at least two days before the due date to receive a deferral. Deferrals will be granted at the instructor’s discretion, of course. HW2: Chernoff Bounds Assigned Thursday September 28, due Thursday October 12. HW3: The Probabilistic Method Assigned Thursday October 12, due Thursday October 26. HW4: Randomized Data Structures Assigned Thursday October 26, due Thursday November 9. HW5: Fingerprinting and Markov Chains Assigned Thursday November 16, due Thursday November 30.